CB Bucknor left Friday's White Sox-Tigers game in the 2nd inning due to a lower body injury before returning in the 3rd. CB Bucknor motions toward his right leg. With one out and none in the bottom of the 2nd inning, Tigers batter Jose Iglesias hit a single to right field. 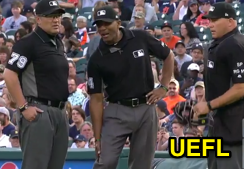 After the play, Bucknor called together his crewmates and the Tigers training staff while appearing to favor his right leg, ultimately exiting the field due to what MLB initially described as an apparent hamstring injury. Bucknor was replaced at first base by 2B Umpire Manny Gonzalez, while HP Umpire Mark Carlson remained behind home plate, and Crew Chief Fieldin Culbreth remained at third base. In the 3rd inning, Bucknor returned to the field and the crew resumed standard operation. Relevant Injury History: There is no recent relevant (e.g., lower body) injury history. Bucknor experienced a 13-day absence earlier this season due to a foul ball head injury, and slipped and fell while making a call at second base in 2014, but did not leave the game afterward. Last Game: June 2, 2017 | Return to Play: June 2, 2017 | Total Time Absent: One Half Inning.